Seniors Haley Montgomery and Janel Passey, Wood River High School’s top female cross country runners this fall, clocked season-best times on a breezy day and moved up on the athletic.net listing of Gem State 4A female runners last Friday. At the Mountain Home Invitational prep meet for 172 varsity and 248 junior varsity runners, Montgomery (20:33) finished third overall and Passey (21:28) was a strong 12th of 76 girls on the Desert Canyon Golf Course challenge. They led the Wolverine girls into fifth place overall out of 12 varsity schools. Montgomery’s time is 12th best out of all 4A runners and Passey moved up to 31st. Friday’s winner, Skyview of Nampa senior Jocelyn Barber (20:06) has the eighth-fastest 4A time. 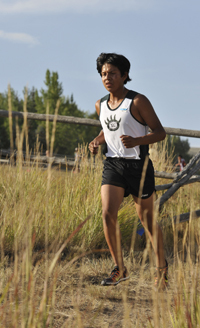 Next up: Runners from 32 schools are due at the Dani Bates Invitational meet today, Wednesday, Oct. 2 at 2 p.m. along the Snake River at Canyon Springs Golf Course in Twin Falls. Barnes 25:05 (76 runners). Team (from athletic.net): 1—Bishop Kelly of Boise 45. 2—Skyview of Nampa 69. 3—Elko (Nev.) 89. 4—Emmett 107. 5—Wood River 122. 6—Jerome 132 (12 schools). Boys’ varsity: 1—Jeremy Stark (Twin Falls) 16:31. 19—Alexis Gonzalez (WR) 17:16. 32—Ty Reinemann (WR) 18:20. 49—Nathan Stouffer (WR) 18:58. 53—Nelson Cantrell (WR) 19:04. 59—Irvin Gonzalez (WR) 19:23. 62—Connor Hayes (WR) 19:40. 71—Sam Burns (WR) 20:23 (96 runners). Team: 1—Twin Falls 40. 2—Kuna 62. 3—Bishop Kelly of Boise 74. 4—Columbia of Nampa 120. 6—Jerome 133. 8—Wood River 257 (14 schools). Boys’ junior varsity: 1—Porter Wilkes (Vallivue) 17:23. 67—Asher Loomis (WR) 21:10. 75—Alexis Quinonas (WR) 21:26. 79—Cooper Dean (WR) 21:11. 86—Kenny Pratt (WR) 22:04. 96—Evan Hesselbacher (WR) 22:28. 109—Cormac Heneghan (WR) 23:27. 110—Beckett Dykhouse (WR) 23:42. 124—Colby Castle (WR) 26:40. 125—Ryan Halopoff (WR) 30:08 (135 runners). Team: 1—Bishop Kelly 31. 2—Vallivue of Caldwell 44. 12—Wood River 349 (12 schools). Girls’ junior varsity: 1—Sydney Engelhardt (Bishop Kelly) 22:19. 17—Hallie MacPherson (WR) 24:15. 43—Brooke Sundholm (WR) 24:48. 45—Alyson Cavallo (WR) 25:47. 87—Alexandra Begley (WR) 28:40. 89—Yisel Reigle (WR) 28:50. 98—Chloe Lichtenberg (WR) 30:10 (113 runners) Team: 1—Bishop Kelly 15. 2—Elko (Nev.) 95. 8—Wood River 185 (9 schools).